Cellulose-binding modules (CBMs) are non-catalytic domains typically occurring in glycoside hydrolases. Their specific interaction with diverse polysaccharides assists hydrolysis by the catalytic subunits. In this work, we have exploited the interactions between a CBM from family 3 (CBM3) and cell wall polysaccharides to alter the structure and mechanical properties of cellulose microfibrils from BY-2 tobacco cell suspension cultures. A CBM3 from Clostridium thermocellum was overexpressed in the cells using Agrobacterium-mediated transformation. Water suspensions of cellulose microfibrils were prepared by the removal of the non-cellulosic components of the primary cell walls, followed by mild disintegration using sonication. The morphology of the microfibrils was characterized by transmission electron microscopy and atomic force microscopy. These cellulose microfibrils were further hydrolyzed with 64 wt% sulfuric acid to produce cellulose nanocrystals (CNCs). The average length of CNCs prepared from the CBM3-transformed cells was 201 nm, higher than that from the wild-type cells (122 nm). In addition, the mechanical properties and deformation mechanism of nanopapers prepared from suspensions of cellulose microfibrils were investigated. 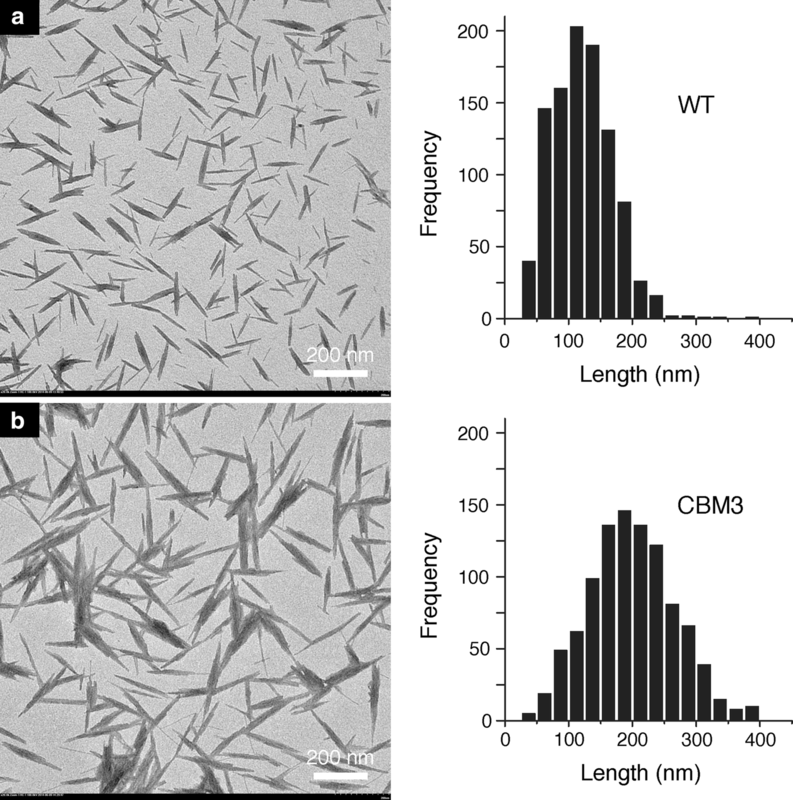 The nanopapers obtained from the CBM3-transformed cells exhibited enhanced tensile strength and work of fracture, 40% and 128% higher than those prepared from wild-type tobacco cells, respectively. The online version of this article ( https://doi.org/10.1007/s10570-019-02285-4) contains supplementary material, which is available to authorized users. 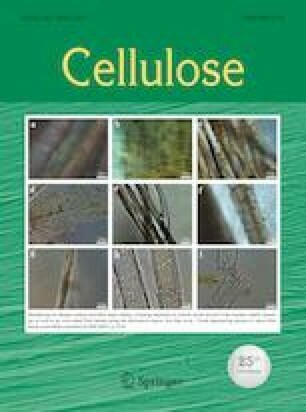 In plant primary cell walls, cellulose microfibrils (CMFs) act as a load bearing component embedded in a hydrated matrix of hemicelluloses and pectins (Brown 2004; Carpita and Gibeaut 1993; Somerville 2006). CMFs are synthesized at the surface of the plasma membrane by large cellulose synthase complexes designated as rosettes. Cellulose nanofibers or cellulose nanofibrils (CNFs) are three orders of magnitude smaller than intact plant fiber cells, and have attracted particular attention in nanotechnology and material sciences recently. CNFs can be prepared from diverse sources, such as wood pulp, bacterial cellulose, and food processing waste streams. Extensive efforts have been devoted to their preparation and characterization, and to the fabrication of new CNF-based composite structures, including films, fibers, aerogels, and hydrogels (Klemm et al. 2011; Moon et al. 2011). The preparation of CNFs generally requires several steps, typically an enzymatic pretreatment and/or a chemical modification step followed by mechanical homogenization. For example, CNFs with uniform width similar to that of individual CMFs spun by single rosettes (ca. 3.5 nm) have been successfully prepared from wood pulp fibers using chemical pretreatment and subsequent mechanical disintegration (Pei et al. 2013; Saito et al. 2006). Each of the preparation steps influences the particle shape, size and size distribution, and interfacial properties of the CNFs obtained. In order to exploit improved preparation methods to decrease the internal damage in CNFs and lower the energy consumption required, an increased understanding of the mechanism involved in plant cell wall formation and its recalcitrance to degradation is essential. To make biomass less recalcitrant to processes for energy production, such as biofuel generation, the cell wall can be modified by altering its chemical composition or properties through genetic engineering (Albersheim et al. 2010). The modification of the biosynthetic process of cellulose in plant cell walls has great potential to alter the structure of cellulose microfibrils and decrease their resistance against chemical and mechanical treatments. However, the impact of such genetic engineering approaches on the extraction of cellulose nanomaterials from biomass, including nanofibrils and nanocrystals, has not been addressed previously. Cellulose synthesis in plants has been affected in vitro using cellulose-binding modules (CBMs) (Shpigel et al. 1998). CBMs are non-catalytic domains that naturally occur in glycoside hydrolases. Some of them bind specifically to different forms of cellulose. For instance, CBMs from family 3 are typically specific for crystalline cellulose (Tormo et al. 1996) and this binding activity can potentially be exploited for the modification of cellulose (Shoseyov et al. 2006). 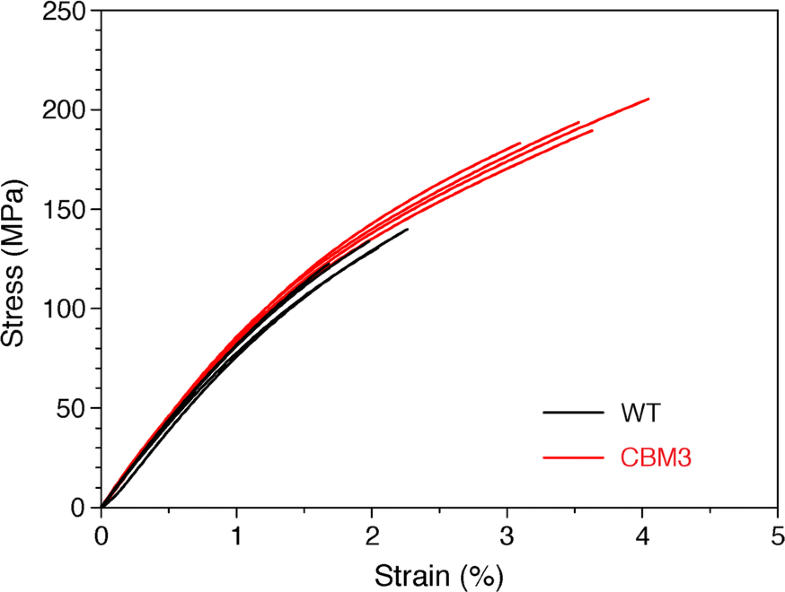 This is illustrated through the use of CBMs to crosslink cellulosic fibers in paper to improve mechanical properties (Levy et al. 2002a). Recombinant proteins containing a CBM and an adhesion sequence were used to modify bacterial cellulose (Andrade et al. 2010). The properties of bacterial cellulose have also been successfully modified in vitro by the addition of CBMs or endo-1,4-β-glucanases (Levy et al. 2002b) to the cell culture medium. The presence of these proteins in plant cell cultures resulted in a significant elongation of the plant cells (Shpigel et al. 1998). Furthermore, the overexpression of CBMs in Nicotiana, Arabidopsis or Populus led to an increased biomass production (Shani et al. 1999), while the paper made from pulp fibers arising from poplar trees that express CBMs was characterized by an increased mechanical performance due to structural changes in cellulose (Shoseyov et al. 2003). Here suspension-cultured tobacco (Nicotiana tabacum) cells were genetically engineered to overexpress CBM from family 3 (CBM3). The influence of CBM3 overexpression on the structure and mechanical properties of the CMFs synthesized in the primary walls was studied. Cellulose was extracted from the suspension-cultured cells by sequential removal of the non-cellulosic components of the primary cell walls. Cellulose nanocrystals (CNCs) were prepared from the extracted cellulose by using acid hydrolysis, and characterized. CMFs were individualized from the extracted cellulose by ultrasonication. Nanopapers were prepared from the CMFs arising from the cells overexpressing CBM3 and from the wild type (WT) cells. The mechanical properties and deformation mechanism of these nanopapers are presented. CBM3 from the Clostridium thermocellum cellulosome integrating protein (GenBank accession number ABN54273) was expressed in tobacco BY-2 cell suspension cultures (Nicotiana tabacum L. cv. Bright Yellow-2, DSMZ PC-1181) grown in Murashige and Skoog medium (Supporting Information). All other materials and chemicals were purchased from Sigma-Aldrich and used without further purification. Ultrapure water (resistivity ≥ 18.2 MΩ cm) was used in all experiments. Suspension-cultured tobacco cells from WT or CBM3 lines (200 g) were washed extensively and resuspended in water to a total weight of 500 g. The suspensions were placed in an oven at 65 °C, and NaClO2 (4 g) and acetic acid (1.375 mL) were added every 15 min for a total of four times. The suspensions were then removed from the oven and kept overnight at room temperature. The samples were subsequently washed 4 times in deionized water by centrifugation (17700 g for 15 min; Avanti J-26XP centrifuge (Beckman Coulter Corp., USA)). The pellets were resuspended in water to a total weight of 300 g and 30 mL of 100 mM sodium acetate buffer pH 5 was added. The suspensions were then incubated at 100 °C for 1 h and 3 mL K2CO3 (2 M)/CDTA (0.3 M) was added prior to a further overnight incubation at room temperature. The samples were successively washed twice by centrifugation as above, resuspended in 5.6% KOH to a total weight of 300 g and incubated overnight at 4 °C. The insoluble material corresponding to the extracted cellulose was washed by centrifugation until neutral pH was reached, and resuspended in water to a solid content of 0.2 wt%. The cellulose extracted from the primary walls of suspension-cultured tobacco cells was disintegrated by sonication using a Branson Sonifier 250 instrument (Branson Ultrasonics Corp., U.S.A). The suspensions (0.2 wt%) were sonicated in batches of 100 mL each, using a probe with a tip diameter of 13 mm. The samples were cooled down to 4 °C before the sonication treatment. The freeze-dried cellulose extracted from the WT or CBM3 lines (100 mg) as described above was hydrolyzed in 1 mL of 64 wt% H2SO4. The reaction was performed for 45 min at 45 °C under continuous stirring and stopped by dilution with deionized water. The suspensions were dialyzed against deionized water using regenerated cellulose dialysis membranes (Spectrum Spectra/Por, 12,000–14,000 molecular weight cut-off) for 7 days until constant neutral pH was reached. Mixed bed ion-exchange resin (Dowex Marathon MR-3 hydrogen and hydroxide form) was added to the cellulose suspensions for 48 h and then removed by filtration. The samples were sonicated for 1 min with cooling in an ice bath to obtain colloidal suspensions of CNCs. Water suspensions of the prepared CMFs (0.3 g dry weight) were diluted from 0.2 to 0.1 wt%, degased, and filtered under vacuum using a membrane filter (DURAPORE® 0.65 μm, DVPP, Millipore, Ireland) until a freestanding hydrogel was formed. Nanopapers were prepared by drying the hydrogels with an automatic sheet former (Rapid Köthen, RK3A-KWT PTI, Germany) at 93 °C for 20 min, as typically performed for the preparation of nanopapers from wood pulp CNFs (Henriksson et al. 2008). The extracted cellulose and CMFs were analyzed by field-emission scanning electron microscopy (FE-SEM). All samples were diluted to 0.1 wt% and freeze-dried using liquid nitrogen. The samples were glued with carbon tape to metal stubs and coated with a thin layer of platinum/palladium using a sputter coater (Cressington 208HR), and observed with a Hitachi S-4800 FE-SEM microscope working at low acceleration voltage and short working distance. The turbidity of the diluted suspensions of CMFs (0.1 wt%) was studied using a UV–visible spectrometer CARY50 Bio (Varian, Inc., U.S.A.). Light transmittance was measured from 200 to 700 nm using quartz cuvettes. The prepared CMFs and acid hydrolyzed CNCs were examined by transmission electron microscopy (TEM). For each sample, dilute water suspensions were deposited on carbon-coated grids and negatively stained with 2 wt% uranyl acetate. All specimens were observed using a Hitachi transmission electron microscope HT7700 operated in high contrast mode at 100 kV. The morphology of the CMFs and the surface structure of CMF nanopapers were studied by atomic force microscopy (AFM, Nanoscoper IIIa Veeco, U.S.A.). Dilute suspensions (100 µL, 0.005 wt%) of the CMFs were dried on freshly cleaved mica substrates glued to a magnetic support. The samples were scanned using the tapping mode under ambient air conditions. RTESP silica cantilevers, with a spring constant of 40 N/m, were oscillated near their resonance frequency between 200 and 400 kHz. The nanopaper samples were directly glued onto a magnetic support and imaged at room temperature using ScanAsyst-air cantilevers and the ScanAsyst mode (Bruker, USA). The density of the nanopapers was determined by dividing the weight of the sample by its volume, as measured by a digital caliper. The mechanical properties of the nanopapers were tested with a Universal testing machine (Instron 5944, Instron, USA). All samples were cut into rectangular specimens of 5 mm in width. The specimens were tested using a strain rate of 2 mm min−1 and a gauge length of 20 mm at room temperature and 50% relative humidity. The elastic modulus was calculated from the slope of stress–strain curves at low strain. At least 5 specimens were analyzed for each sample. The cross-sections of the fracture surfaces after the tensile tests were further analyzed by FE-SEM. To avoid fibrillation and maintain the original primary cell wall structure, blending steps were omitted from cellulose extraction procedures. As shown in the FE-SEM micrographs (Fig. 1), the extracted cellulose obtained from the BY-2 cells consisted essentially of flattened cells, which are commonly called “cell ghosts”. These cell ghosts appeared as micrometric particles retaining the overall shape of individual intact cells. The extracted cellulose particles prepared from the CBM3 line (Fig. 1b) exhibited a higher aspect ratio compared to their counterparts from the WT line (Fig. 1a), indicating BY-2 cells expressing CBM3 exhibited a significantly elongated shape with a smaller lateral size compared to WT cells. Similar phenotypes were reported in in vitro cultures of peach and Arabidopsis cells grown in the presence of added CBMs (Shpigel et al. 1998). 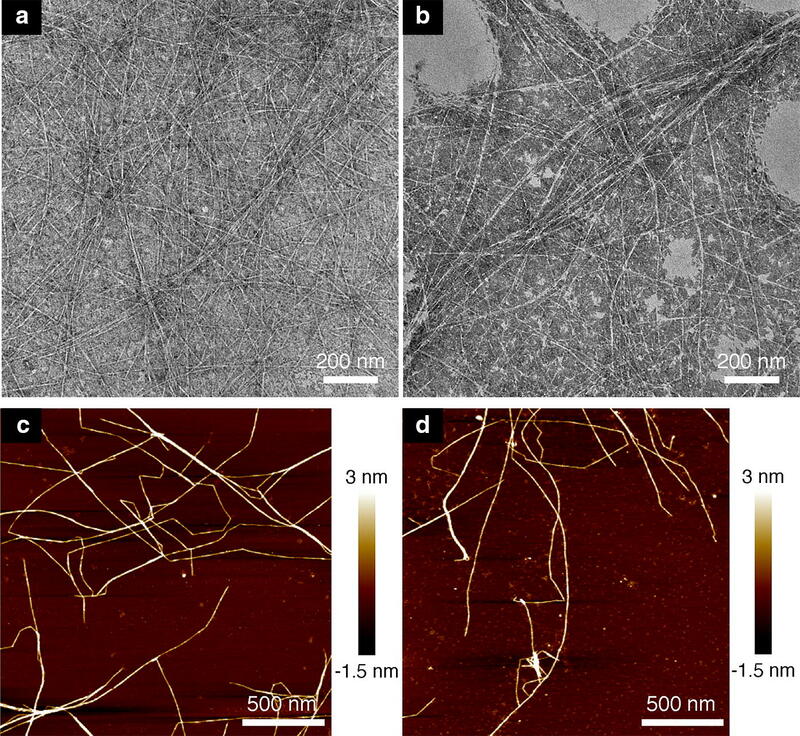 As clearly shown at higher magnifications, the extracted cellulose particles showed a predominant sheet-like structure with cellulose microfibril networks on the surface for both the CBM3 and WT lines. 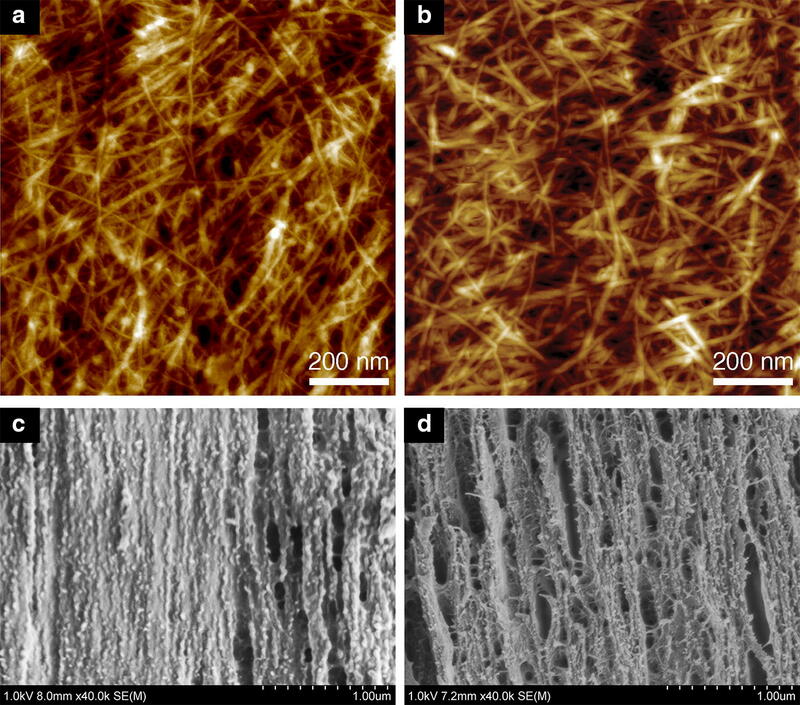 Aggregations of cellulose fibrils are also observed due to the concentration of CMFs near the ice grain boundaries inside the micrometric particles during the freeze drying process. Suspensions of extracted cellulose particles from the WT and CBM3 lines were sonicated to prepare individual CMFs. The cellulose suspensions were turbid before sonication and sedimented quickly at rest (Fig. 2a). After 3 min sonication, the transparency of the suspensions significantly increased. No flocculation or sedimentation was observed even after resting for 3 days on the lab bench. A comparably high stability of CMF suspensions from primary cell walls was also reported for sugar beet (Dinand et al. 1996). The light transmittance of a randomly oriented suspension of very long rod-like particles depends on the dimension of the cross-section of the suspended nanofibrils (Casassa 1955). A high transmittance of a CNF suspension indicates a low width of individual nanofibrils, i.e., a high degree of disintegration from the extracted cellulose. Figure 2b shows the light transmittance of dilute CMF suspensions (0.1 wt%) from the WT and CBM3 lines that were prepared by sonication. After sonication for 1 min, both the WT and CBM3 samples showed a transmittance of 80–90% at 400–800 nm. After 3 min sonication, the transmittance increased to 95–98% for both samples. These values are very similar to those obtained for fully individualized CNFs prepared by TEMPO-mediated oxidation of softwood pulp fibers, which exhibited a uniform nanofibril width of 3–5 nm (Saito et al. 2006). Increasing the sonication time to 10 min did not result in an increased light transmittance (data not shown), indicating that the defibrillation was complete after only 3 min sonication. Longer sonication times would lead to a decreased length of the microfibrils, as reported previously (Fukuzumi et al. 2013). The light transmittance of the CMF suspension from the CBM3 line is higher than that from WT, suggesting a better individualization and less aggregation of CMF fibrils in the suspension. The FE-SEM micrographs corresponding to the CMFs prepared by sonication are shown in Fig. 3. Compared to the cellulose particles obtained by sequential extractions of tobacco cells from WT and CBM3 lines (Fig. 1), the samples from both lines were no longer suspensions of individual micrometric particles, but rather a homogeneous and continuous network of well individualized CMFs. Very few aggregates of microfibrils, possibly originating from the freeze-drying step performed prior to observation, were also observed. Thus, it can be concluded that a complete disintegration of the cell wall structure was reached after only 3 min of sonication. This defibrillation treatment is much milder than those previously used to prepare CMFs from other primary cell wall sources, such as beet root and potato (blending, 15 min followed by homogenization, 15 passes, Dinand et al. 1996; Dufresne et al. 2000) or fruit tissues (sonication, 30 min, Niimura et al. 2010). The morphology of individual CMFs from the WT and CBM3 lines was further studied by TEM and AFM (Fig. 4). Both samples were negatively stained with uranyl acetate prior to TEM observation to improve contrast. Completely individualized CMFs with a minor amount of CMF bundles were observed. The CMF bundles resulted from drying. Previous work reported the presence of large bundles of up to 50 microfibrils in samples prepared from other primary cell wall sources such as sugar beet pulp, potato tuber cells, and celery collenchyma (Dinand et al. 1996; Dufresne et al. 2000; Thomas et al. 2013). It is noteworthy that the tobacco cells we used were never dried before the extraction of cellulose and defibrillation by sonication. This procedure likely leads to a more efficient defibrillation of cellulose microfibril aggregates that naturally occur in primary cell walls. The width of the nanofibrils measured from TEM images was of the order of 4–6 nm. No differences were observed between CMFs from the WT and CBM3 lines. The width of the CMFs from both lines was also measured from AFM height images (Fig. 4). To avoid overestimation of the width due to a profile broadening effect during the scanning of the samples, the width of the CMFs was determined by subtracting the height of the mica substrate to the measured height of the nanofibrils. With this approach, CMFs from both WT and CBM3 lines were calculated to be 2–3 nm wide. This value was smaller than that measured from TEM images. As indicated by Niimura et al. 2010, AFM is a more precise method than TEM for width determination as it avoids overestimations due to negative staining in TEM analysis. The width measured for CMFs from our tobacco cells is slightly larger than that of cellulose microfibrils from fruit tissues (1–2 nm) observed by AFM (Niimura et al. 2010), but similar to that of microfibrils from sugar beet (2–4 nm, Dinand et al. 1996) or potato (2–4 nm, Dufresne and Vignon 1998) and smaller than that measured by TEM from onion tissues (5–12 nm, McCann et al. 1990). Furthermore, our measured width of 2–3 nm is in good agreement with the lateral size of cellulose crystals from blackberry cells (Rubus fruticosus) determined by synchrotron X-ray diffraction (2.1 nm, Lai-Kee-Him et al. 2002) and the microfibril diameter of celery collenchyma (2.9–3 nm) determined by small-angle neutron scattering (Thomas et al. 2013). The length of the CMFs was not measurable from the TEM and AFM images as no evident ends were visible in the CMF images. Thus, it can be inferred that the length of the CMFs is in the range of at least several micrometers. Cellulose extracted from the WT and CBM3 tobacco cells was hydrolyzed following a typical strong acid treatment to study the effect of CBM3 overexpression on the crystal structure of cellulose (Rånby 1951). This process, commonly employed for the preparation of cellulose nanocrystals (CNCs), was used to remove the disordered regions in cellulose and preserve the ordered regions that are less sensitive to acid hydrolysis. Thus, the length of CNCs reflects the length of highly ordered regions spaced along the CMFs (Habibi et al. 2010). The yields of the hydrolysis reactions were of 11% and 24% for cellulose from the WT and CBM3 lines, respectively. Such low yields are probably due to the low crystallinity of cellulose from primary cell walls (Thomas et al. 2013). The morphology of the CNCs was studied by TEM (Fig. 5). CNCs appeared as aggregates of several individualized CNCs, similar to the observation made by Lai-Kee-Him et al. 2002. Length distribution histograms of the CNCs were obtained from TEM images. CNCs from the CBM3 line (Fig. 5b) are significantly longer than those from the WT line (Fig. 5a), with an average length of 201 nm compared to 122 nm, respectively. The higher yield and longer CNCs observed for the CBM3 line suggest that cellulose in the transgenic cells exhibit a much higher order and resist acid hydrolysis better than their WT counterpart. Nanopapers were prepared from water suspensions of CMFs and their mechanical properties were evaluated. The strain–stress curves in uniaxial tension are shown in Fig. 6. The mechanical properties of the nanopaper prepared from the CBM3 line (density of 1.41 ± 0.03 g cm−3) were remarkably higher than those of nanopapers from the WT line with similar density (1.42 ± 0.01 g cm−3). The elastic modulus of the nanopaper from the CBM3 line was 9.3 ± 0.2 GPa, i.e., higher than that measured for its WT counterpart (8.3 ± 0.5 GPa). The tensile strength of the CBM3 nanopaper was of 198 ± 9 MPa, which is about 40% higher than that of the WT nanopaper (143 ± 8 MPa). The ductility of the nanopaper from the CBM3 line was also higher, with a strain-to-failure of 3.6 ± 0.4%, compared to the 2.3 ± 0.4% for the nanopaper from the WT line. Thus, the nanopaper from the CBM3 line presents a work-of-fracture of 4.38 ± 0.72 MJ m−3, i.e., twice as high as that of the nanopaper from the WT line (1.92 ± 0.46 MJ m−3). Such significant improvements in the mechanical properties of material derived from the CBM3 engineered line is attributable to the observed higher ordered domains in cellulose. The mechanical performance of nanopapers prepared from tobacco CMFs was higher than previously reported for nanopapers composed of CMFs from primary cell walls of other organisms. For example, Dufresne et al. (1997) reported a tensile strength, strain-to-failure, and elastic modulus of 8 MPa, 11% and 1.3 GPa, respectively, for sheets of sugar beet CNFs. 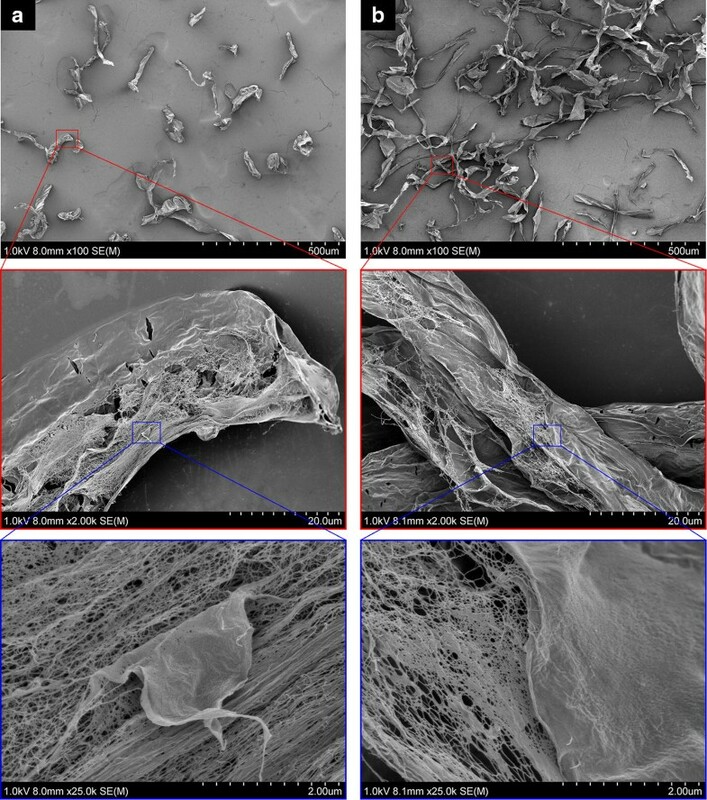 Nanofiber films prepared from carrots with a chemical-free refining process had a tensile strength of 65.71 ± 1.67 MPa and a modulus of 6842.3 ± 627.6 MPa (Varanasi et al. 2018). The mechanical properties of the nanopaper prepared from the primary cell wall CMFs isolated from the CBM3 line are comparable with that of the cellulose nanopaper derived from secondary cell wall CNFs prepared from wood pulp fibers, which has a modulus of 13.2 GPa and a tensile strength of 214 MPa (Henriksson et al. 2008). The surface morphology of the nanopapers prepared from the WT and CBM3 cells was observed by AFM (Fig. 7). Both samples showed a random-in-plane network of CMFs, typical for cellulose nanopapers (Henriksson et al. 2008). As observed by FE-SEM, the tensile-fractured surfaces of the nanopapers from both cell lines exhibited a laminate structure (Fig. 7). This structure was more compact than those observed previously for tensile-fractured surfaces of CNF nanopapers composed of softwood pulp fibers (Henriksson et al. 2008). This phenomenon is possibly caused by the high density of the nanopapers prepared from the WT and the CBM3 lines compared to that of nanopapers from wood pulp (density of 1.215 g cm−1, Henriksson et al. 2008). The tensile-fractured surface of the nanopaper from the CBM3 line appears more porous compared to the WT sample. This suggests a different deformation behavior during tensile test. 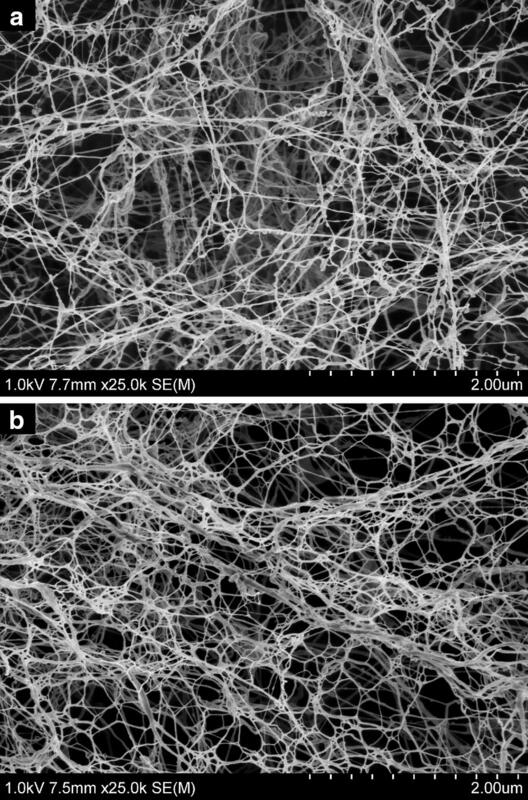 The CMFs with longer and higher ordered domains of cellulose from the CBM3 line produced a stronger nanofibrillar network. This allowed more sliding between the laminated sheets before breakage, resulting in higher strain-to-failure and deformation-induced porosity in the sample from the CBM3 line. Because of stress-induced sliding and rearrangement of the CMFs, some CMFs were pulled out of the tensile-fractured surfaces of the specimen derived from the CBM3 line (Fig. 7d), while the CMFs from the WT line broke cleanly at the tensile-fractured surfaces (Fig. 7c). The enhanced mechanical performance revealed for the nanopaper composed of CMFs from the CBM3 line suggests that the engineering of the tobacco cells results in a cellulose microfibrils network with significantly enhanced strength and toughness, thus giving higher extensibility to the primary cell wall. This could explain the remarkably elongated shape of the tobacco cells overexpressing CBM3, as evidenced by the SEM analysis of the cell ghosts (Fig. 1), since a cell wall more prone to stretching may ease expansion. Previous studies of papers prepared from wood pulp fibers from transgenic poplar trees overexpressing CBMs showed similar improvements in mechanical performance (Shoseyov et al. 2003). 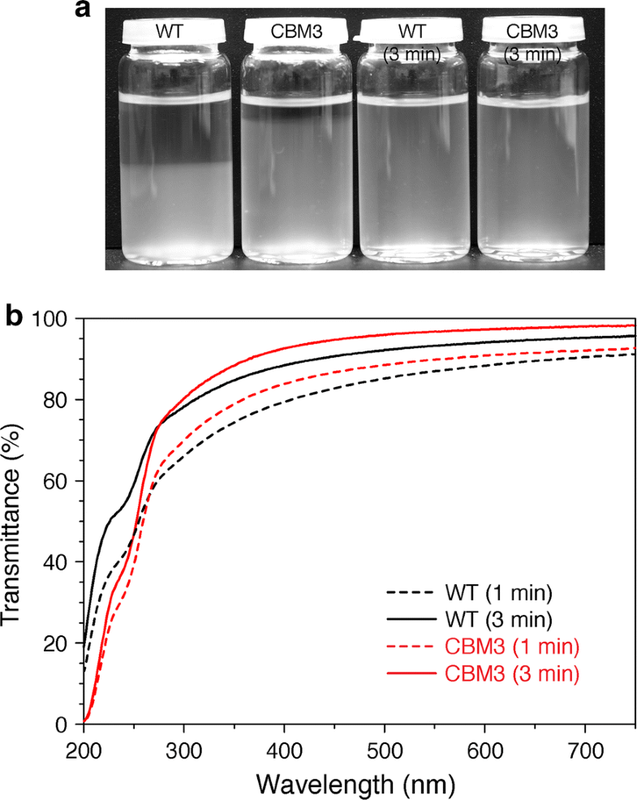 Altogether, these observations suggest that the in vivo expression of CBM3 in plants improves the mechanical performance of both primary and secondary cell walls. We have demonstrated that the structure and properties of cellulose microfibrils from plant cells can be modified by interfering with the biosynthesis of cellulose through the overexpression of CBMs. CMFs were successfully prepared from WT and CBM3 transformed tobacco cells by the removal of non-cellulosic components in primary cell walls, followed by a very mild mechanical treatment (3 min sonication). In addition, the structure of the ordered domains in cellulose from the WT and CBM3 cells was studied after strong acid hydrolysis to produce CNCs. The CNCs obtained from the genetically modified cells were twice as long as those from the WT cells. This result suggests a different arrangement of the ordered regions in cellulose from WT and CBM3 samples. The longer and higher ordered regions in cellulose from the CBM3 cells correlated with higher production yields of CNCs, and resulted in a significantly improved strength and toughness of the corresponding nanopaper. The authors thank the Swedish Research Council Formas (CarboMat, 2009-1687) and the EU FP7 MultiBioPro project (Grant Agreement No. 311804) for supporting this work.